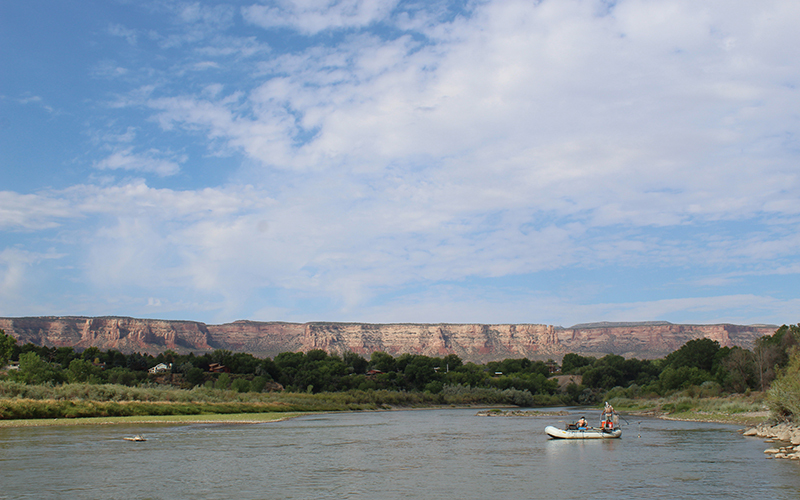 GRAND JUNCTION, Colo. – The temperature is hovering around 90 degrees as Dale Ryden and I float down the Colorado River near Grand Junction. The turbid water looks inviting, a blessed reprieve from the heat, but if either of us jumped in, we’d be electrocuted. “It can actually probably be lethal to people if you get in there,” said Ryden, a fish biologist with the U.S. Fish and Wildlife Service. Ryden’s co-workers cruise by in gray and blue inflatable rafts, their bows fitted with a rig that suspends metal spheres the size of disco balls from electric cables. When the balls are lowered into the river, a generator at the back of each raft sends current through the balls into the water. What lies beneath the surface – Ryden likened it to Ovaltine – is a mystery the biologists intend to explore. Fish that venture near the electrified rafts are momentarily stunned and pulled from the water with nets. Today’s mission is to remove non-native fish – such as smallmouth bass that feed on the fry of the four endangered species found in the river. The bass will be collected, measured, weighed, stored in bags and eventually sent to a landfill. 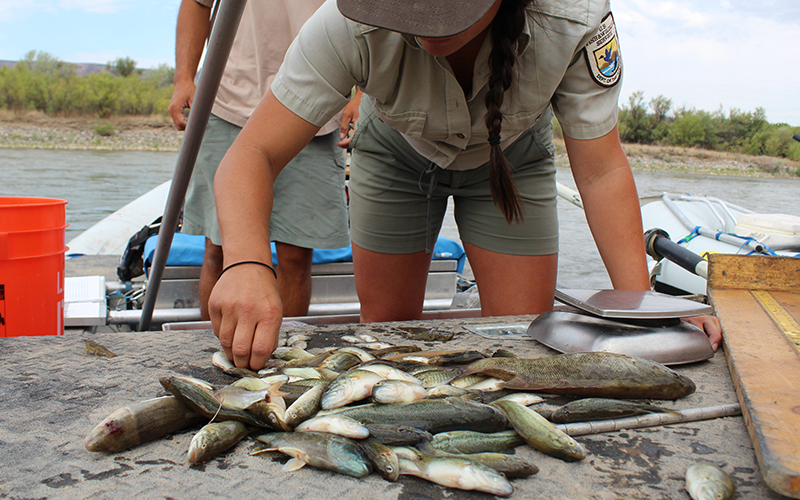 Any of the four endangered species – bonytail, razorback sucker, Colorado pikeminnow and humpback chub – we encounter will be treated with care and released back into the river. Ryden has a tough, and some would say impossible, job. Every day, he tries to find ways to help fish that evolved to live only in this river system – one of the most engineered ecosystems in the world – survive. Over millions of years, the rushing, sediment-laden water sculpted their bodies with characteristic ridges and bumps, making them well-equipped to handle its highs and lows. But human interference in the rivers they call home has pushed a few to the edge of extinction. However, the era of big dam building in the West fundamentally altered their river home over the past 100 years or so, Ryden said. Dams and diversions have made life close to impossible for these fish. Then people started adding toxic chemicals, pharmaceuticals and a range of invasive fish for sportsmen to catch. About an hour into our trip, there’s a flurry of activity on one of the rafts. 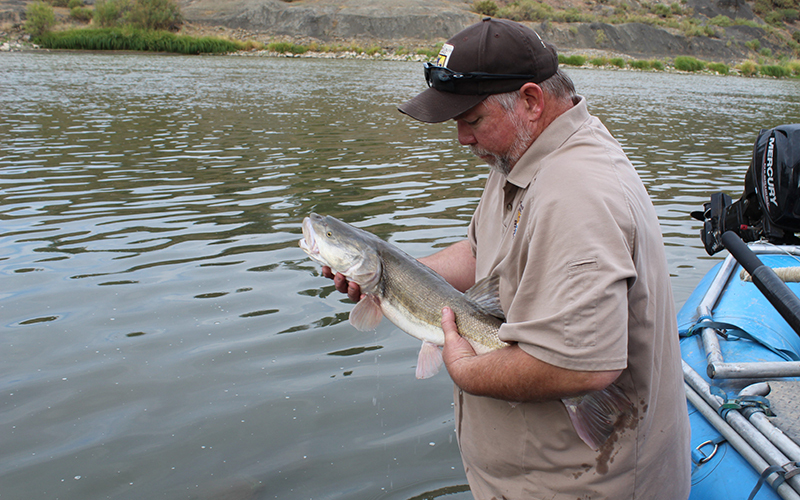 Technician Andrew Disch dips his net and pulls out the river’s historic top predator – the Colorado pikeminnow. It has been listed as endangered for more than 50 years. The fish is impressive, measuring about 3 feet long. But it pales compared to the pikeminnows that once hunted the river, Ryden said. The pikeminnow gulps down prey with a mouth so huge you could put your whole hand inside without touching the sides – something Ryden has tested personally. The torpedo-bodied fish is pale green on top with a white belly and pinkish tail. U.S. Fish and Wildlife Service biologist Travis Francis scanned a microchip biologists inserted in the pikeminnow years ago. “We haven’t we haven’t seen this fish since 2004,” he said, adding that biologists make dozens of passes over this section of river each summer. 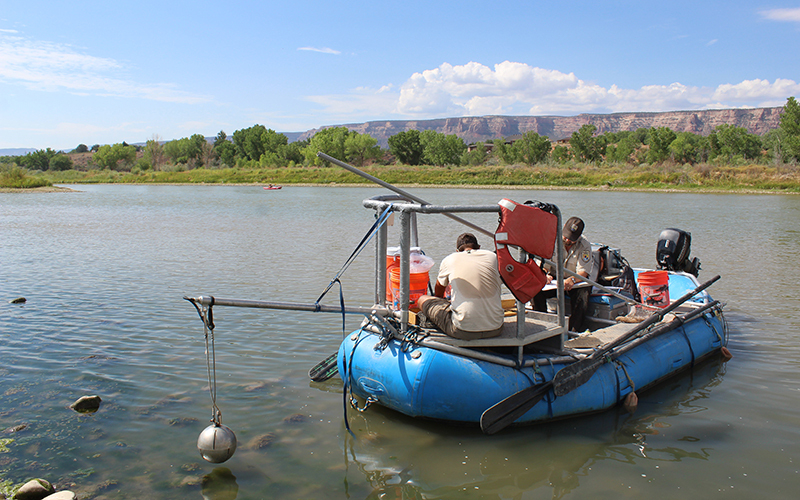 They’ve documented some pikeminnow migrating several hundred river miles from the San Juan River, down through Lake Powell and up to Grand Junction. Early settlers nicknamed the pikeminnow “the white salmon” for such behavior. Ryden estimated 400 pikeminnow exist in the upper reaches of the Colorado River, and close to 800 in stretches of the Green River, a tributary of the Colorado. He likens the pikeminnow to a lioness on the Serengeti: Each is at the apex of its food chain. Now imagine you built a series of concrete walls around the lion, boxing her in, making it difficult to hunt. That’s what dams on the Colorado River have done to the pikeminnow, Ryden said. With both hands he lowers the minnow into the water. It disappears into the murk. During this day on the river, Ryden repeatedly referred to the endangered species as “our fish.” He takes ownership of their protection. They’re something different and more special than the non-native fish that surround them. Since 1988, recovery programs for endangered Colorado River fish have cost hundreds of millions of dollars, funded by a mix of hydropower revenues and money from agencies within the Department of the Interior. Ryden said the effort is beginning to pay off. Two species – the humpback chub and the razorback sucker – are on their way to being downgraded from endangered to threatened. But deciding whether an endangered species is “recovered” is a subject for debate. Some environmental groups have questioned the Fish and Wildlife Service’s decision to downlist the two species. In the case of the razorback sucker, they contend, most of its population growth is the result of an intense breeding and stocking program, not reproduction in the wild. Going forward, it’s unclear how much government intervention will be necessary to keep the sucker from going extinct. 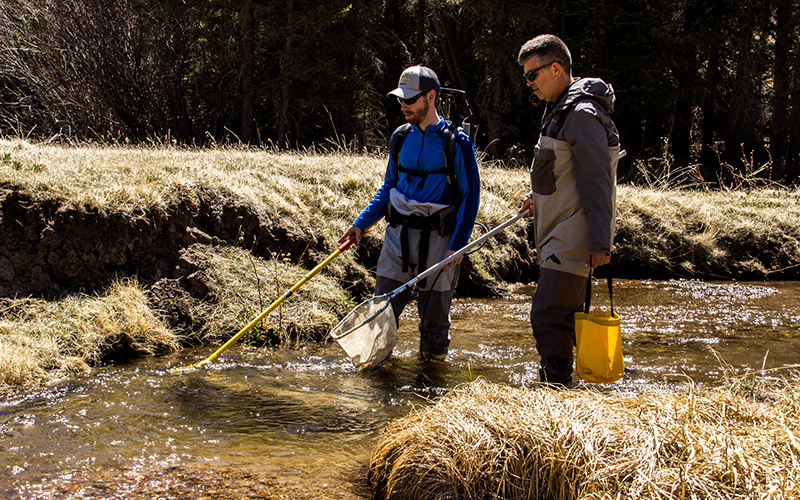 In its proposal to downlist the razorback, the Upper Colorado Endangered Fish Recovery Program recommends that Fish and Wildlife revise the program’s goals, and that its current goals for “recovery,” written in 2002, are inadequate and dated. The program, a partnership of local, state and federal agencies, water and power interests, and environmental groups, is set to expire in 2023. Director Tom Chart said the partners are rethinking what recovery of means, and how best to achieve it. Current goals for the program don’t fully address the need for more coordinated management of flows from the Colorado River system’s reservoirs, removal of non-native fish and stocking of endangered species past 2023, he said. Although the Endangered Species Act of 1973 requires the government to save these fish, it can be tough convincing the public that they’re valuable and the effort isn’t in vain. A razorback sucker, Ryden noted, doesn’t have the charisma of other wildlife. In our last few miles on the river, the biologists net a razorback sucker – the second of the day – and head toward the river bank to scan it. The grayish-green fish is notable for its pronounced hump, which looks like the keel of an overturned boat. That’s when the Morton family from Houston – mom Kate and kids Simon and Claire – floated by on a raft. Ryden, seeing an opportunity to educate the public on the value of the razorback sucker, called them over. He pulled the sucker from the livewell of the raft and presented it to the Mortons. “Go ahead, give it a pet,” Ryden suggested. Simon gently rubbed his fingers along the fish’s scales. Claire tentatively placed an index finger on the razorback’s head. 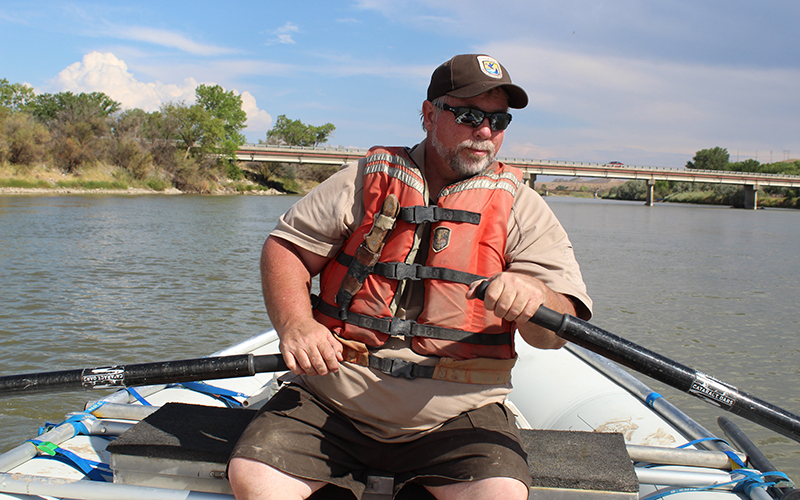 When Ryden first started working on the Colorado River, razorbacks nearly had been wiped out. He didn’t see one during his first four years on the job. One day, a crew brought one into the hatchery for breeding. He remembers the biologists crowding around it, marveling at the novelty of seeing a wild razorback. Ryden leaned in, nearly touching his lips to the fish, and made a kiss sound. 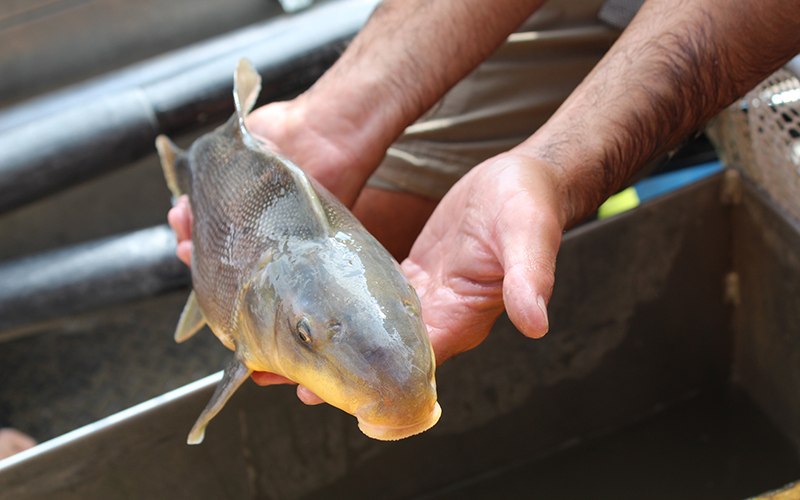 Now, after years of stocking tens of thousands into some reaches of the river, Ryden says razorback suckers are plentiful enough that you can find one on any summer day and give it a kiss.